As I mentioned before, Friday night this week marked the beginning of Passover. 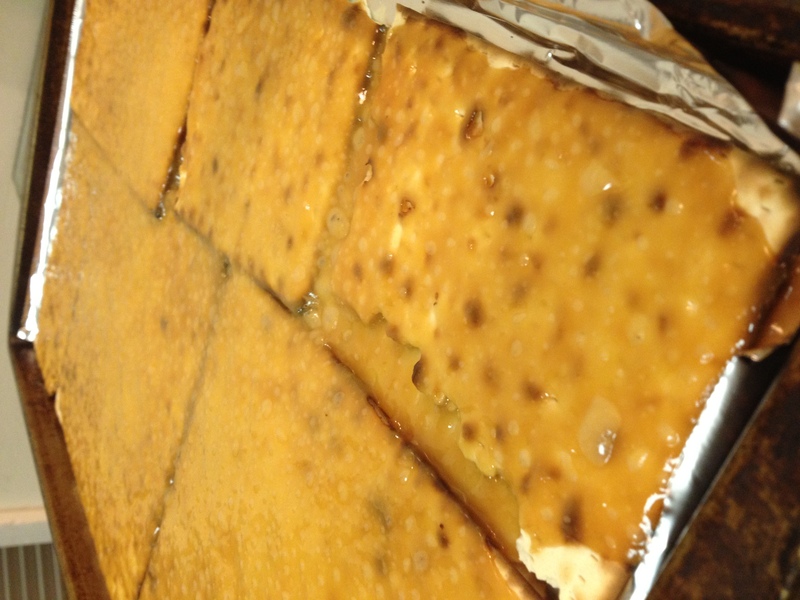 If you’re “keeping” Passover this year, or just have an extra box of Matzah in your house… you have to try this recipe. If you aren’t Jewish and Matzah is completely foreign to you… go buy a box and try it out. You could also make these with Ritz or Butter Crackers. This recipe is one of our family’s new favorites. It was given to us by my Mom’s friend Wendy, so my Mom could sell it at her Chocolate Store. My Mom has to make so much of it now in order to keep it in the store and so we can eat some too! 1. Preheat the oven to 350. Line 2 pans that will fit in your freezer with foil and spread your Matzah evenly. It’s okay if you have to break it. 2. Melt one cup of brown sugar and one cup of butter in a saucepan over medium heat. Stir. When it comes to a boil (you can turn it up just a touch if it won’t boil), let it foam for three minutes. Pour over the Matzo and spread quickly with a spoon or a pastry brush. Try to cover all of the Matzo. 3. Put it in the oven for 7 minutes. Watch it so it doesn’t burn! The recipe even says don’t talk on the phone during this part, because it burns really fast! 4. Meanwhile, melt your chocolate over a double-burner or in the microwave. If using the microwave, only heat over medium-low or defrost, in minute-long intervals, stirring in between. It’s a pain, but again… you want to avoid burning it. 5. Take the matzo out of the oven. 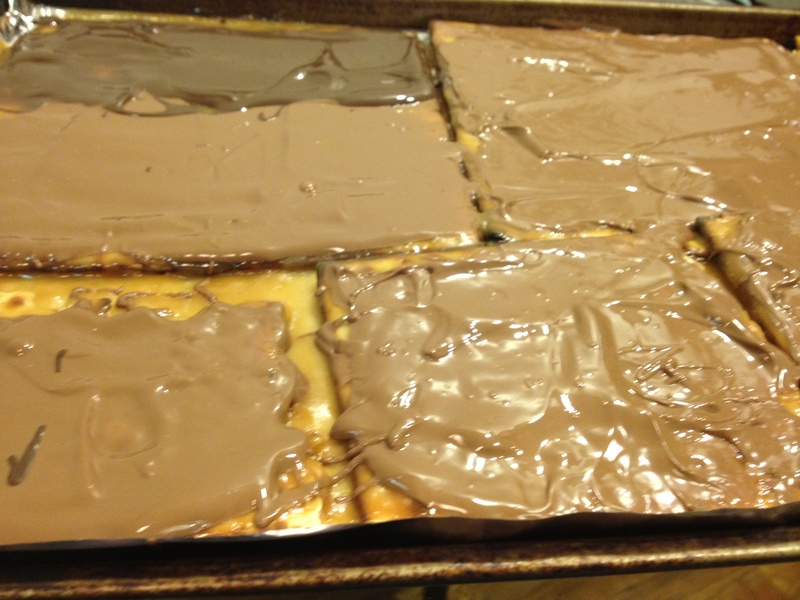 Pour the melted chocolate over the Matzo, spreading it evenly so it covers everything. Take the almonds you’ve crushed and sprinkle them over the melted chocolate. 6. Pop the trays into the freezer for about 15 minutes. Take out and either break it apart or cut it into squares. 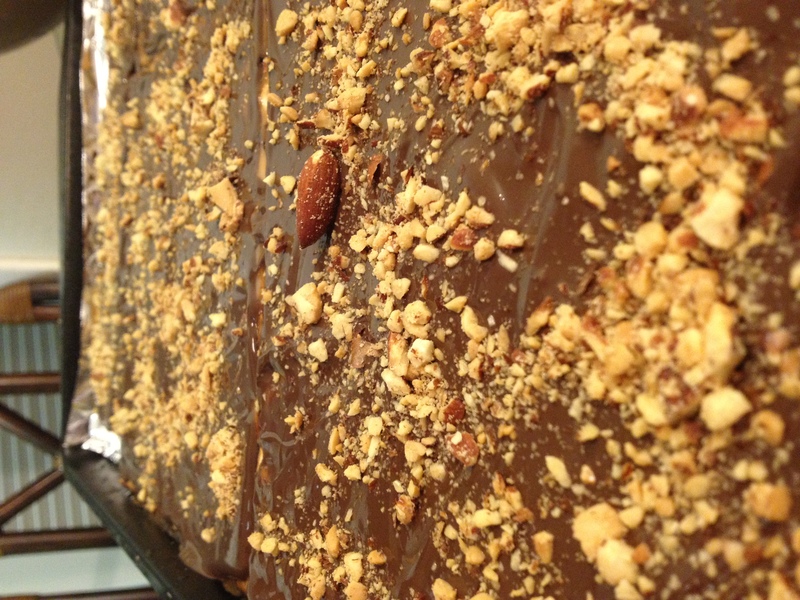 Matzo + Butter Crunch + Chocolate + Crushed Almonds = heaven. I am telling you… you’ll want to repeat this at LEAST once more! I won’t look up the calories… to spare all of us, but this will be an ABSOLUTE HIT! This time around, we did batches of both Milk and Dark Chocolate, plain and with almonds.